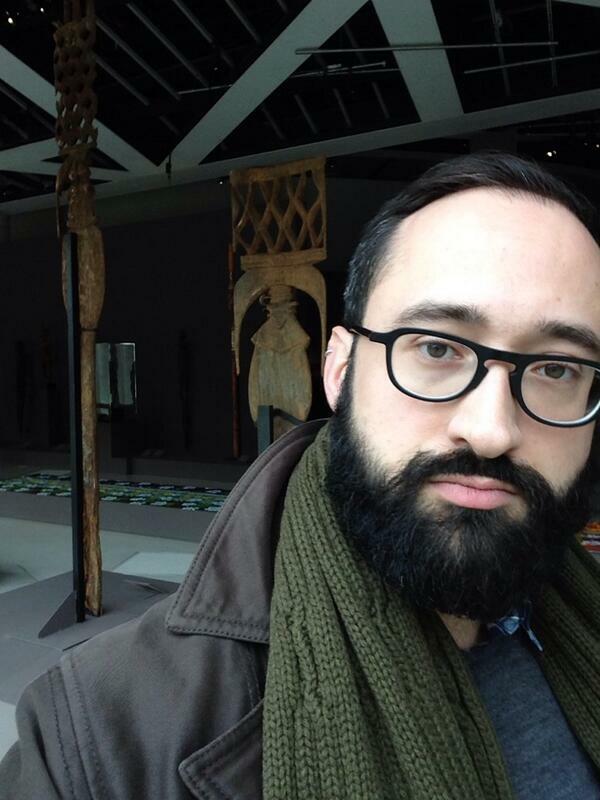 Sébastien Magro is a new media manager at musée du quai Branly in Paris, France. He is particularly interested in the social, collaborative and participatory aspects of interpretation through digital tools. He blogs about museum-related technological and digital practices at dasm.wordpress.com. Sébastien teaches, gives lectures, is an active member of the French museogeeks community and a member of Muzeonum‘s board. He also loves tea, everything that is maple-flavored and dark chocolate, but that is another subject. I have been a New Media Manager at the musée du quai Branly since February 2012. The musée du quai Branly is a French museum about arts and cultures from Africa, Asia, Oceania and the Americas. I’m in charge with coordinating the website board of contributors and I am a community manager. I am also in charge with mobile apps and I do a watch on digital technologies in cultural institutions. I was initially trained as a graphic designer at École Boulle (2003), and I hold a Master in Applied Arts and Design from Université Paris I Panthéon-Sorbonne (2005). I then worked in museums, galleries and festivals, both in Paris, France and Montreal, Qc, Canada. In 2010, I wanted to go back to school and do another Master in Museum Studies but the Université Paris I Panthéon-Sorbonne gave it to me without any course. I just had to write a report on my professionnal experience, showing I had all the skills and knowledge I would have learnt if I took the courses. It’s called VAE (validation des acquis de l’expérience – evaluating your professionnal experience) in France. I can’t recall the moment I got interested in museums, I think it goes back a long time ago when I was a kid. My parents weren’t into museums a lot, but I remember a few visits that had some impact on me: the Egyptian Museum in Torino, Italy, with my grand-father; the Archeological Park of Bibracte, France and, of course, the Louvre, that I visited several times as a kid. As for blogging (and using the web), I guess I spent too much time reading blogs and procrastinating on social media in the mid-2000s, until it finally became my job! My blog is called DASM, which stand for “Design Art Sport Music”, which is what I intended to blog about at the very beginning, back in summer 2009. As time passed, I realised I wanted to connect two interests of mine, personal as well as professional: museums and the Web. Which is why, in 2010, I started blogging about social media in museums, digital interpretation devices, and so on. I never changed the name, but some day I’ll work on my personal website and move my blog there. I blog about web culture, digital devices, and social media in museums. I am interested in what these facts create in museums: new internal organisation, new relationships with their visitors, etc. My most read blog posts are a three part-post that I wrote in 2011. It was supposed to be some kind of an intention letter or abstract for a PhD I was planning to start. It’s a kind of “state of the art” for participatory initiatives in museums, mainly in France. Even if I wrote in few years ago and the examples I listed are quite old (in a web-culture perspective), these three texts are still my most read posts. I visited an exhibition on video games at Cité des Sciences in Paris. There were many games that could be played, and a lot to learn about video games making, as well as some interesting facts on the industry. The exhibition was great, even if was crowded and I couldn’t play a lot – the Cité des Sciences is quite popular, and I think the subject brought many people who do not visit museums usually, which is a great thing. It’s the third exhibition on that subject in Paris in a 5 years-time period, but it’s the only one I got a chance to visit. As I grow up in the 80s and 90s, I’m a big fan of video games, even if I play a lot less now that I used to. Of course, I also get to visit every exhibition at quai Branly. We have four opening this spring, starting next month with ‘Bois Sacré’ about magical societies in the forests of West Africa and ‘L’Atlantique noir’ about activist Nancy Cunard at the beginning of the 20th c. Then ‘Indiens des Plaines’ about Native Americans from the Plains in April and ‘Tatoueurs, tatoués’ which will deal with tattoo art throughout the ages and different parts of the World, in May. I do tweet (and I tweet a lot), since it is part of my job and it’s a way of observing emerging trends in museums, interpretation and technologies. I have a few lists of bloggers, museum professionals, students and academics that I follow. In fact, Twitter is my main online museum resource. If you were forced to spend the rest of your life in a library, a museum or a zoo, which would you choose and why? I’d choose the Natural History Museum in Paris. It’s a fantastic place, with some kind of a 19th century atmosphere. And you can see dinosaur skeletons, as well as, living animals, stuffed animals and exotic plants…what better way to get the feeling of travelling while you’re in downtown Paris? Be curious, be open-minded, and visit as many museums and galleries that you can! And, of course: enjoy your job! Thanks for participating in Meet a Museum Blogger, Sébastien! In case you missed it, Sébastien blogs at DASM. Do you have additional questions for Sébastien regarding his profile above? Feel free to start a conversation in the comments below or reach out to him directly on Twitter at @dasmtweets. Please use the #MuseumBlogger hashtag. TY! Tags: École Boulle, Bibracte, Cité des Sciences, France, French museogeeks community, Louvre, musée du quai Branly, Museo Egizio, Muzeonum, Natural History Museum Paris, new media manager, Paris, Sébastien Magro, Université Paris I Panthéon-Sorbonne. Bookmark the permalink. Enjoyed your thoughts about museums. I love spending time in art galleries and museums.